As there is no homogenous model of how best to grow or sustain a small business, many small business owners are assessing the particular needs of their businesses and choosing a workplace that fits them. Typically, these spaces are either standard commercial office spaces or, increasingly, co-working spaces. In a co-working space, the building owner rents a small portion of an office space, such as a desk or a cubicle, to an individual or few individuals. As such, many different businesses are located in the same space and share the costs of overhead. As with any business decision, potential spaces must be judged on their characteristics over the entire course of their use, which in this blog is broken down into an overview of three stages: agreeing to terms, using the space, and exiting the space. The first major difference between a commercial office lease and co-working agreement is the form of contract. A commercial office lease is generally negotiable, at least in some part, which allows the tenant to have a say in the lease terms, particularly if there are special accommodations required. Many overlooked terms include access and use of the space, expenses not included in rent, actions that constitute breach of the lease, recourse in event of breach, and termination of the agreement, among others. A co-working agreement, on the other hand, is often (though not always) more like a gym membership agreement than a negotiable contract. That is to say, the agreement has mostly standardized terms and is offered on a take-it-or-leave-it basis. The agreement’s terms will specifically include the obligations and entitlements of both parties. In assessing an agreement, it is important to understand what space is offered (e.g., a desk, a cubicle), whether that space is exclusively reserved or not, and what other amenities are offered (printers, fax machines, coffee, etc. ), among other individualized concerns. 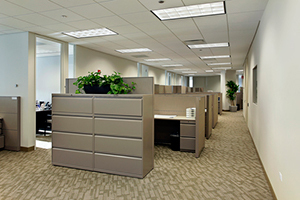 In a commercial office lease, access to the space is generally exclusive to the tenant. As a result, the tenant may freely invite guests, clients, and employees into the space, unless otherwise specified in the lease. Additionally, the tenant has the right to exclude unwanted loiterers, uninvited guests, and non-employees from the space. However, these freedoms may bring obligations under the lease in the form of cleaning, reasonable upkeep, and a greater responsibility to repair or replace damaged elements in the space. In a co-working space, the office is generally shared with other coworkers, and while a renter may have an exclusive right to a particular desk, cubicle, or office, there is no right to exclude a particular person from the greater premises. Additionally, the agreement may specify which guests or clients may enter the space, or which, if any, employees not named in the agreement may use the space. However, the renter generally bears little responsibility for repair or replacement of items in the office itself, unless he causes the damage himself. As an additional benefit, co-working spaces are often marketed toward particular types of businesses, such as professionals, creatives, or start-ups, which can lead to increased collaboration, networking, and camaraderie. Perhaps the most important consideration when entering any agreement or lease is the exit strategy. For any number of reasons, a business may choose to exit an office space, either due to changing physical needs, dissatisfaction with the current space, or physical relocation. These exits are not often foreseeable and can therefore cause unnecessary stress when they occur. In a commercial lease, the period of the term is clearly stated, as are the necessary steps for terminating a lease. Mere inconvenience is not a reason for lease termination and may result in substantial liabilities under the lease document. If these exit and termination procedures are not followed, the tenant may be sued for the remaining amount of outstanding rent payable under the lease. In the event of a lawsuit, the commercial lease is interpreted and enforced consistently with an existing body of law governing leases. Often, coworking agreements have shorter terms, easier termination procedures, and lighter termination penalties. However, these agreements are not generally construed as leases, so if a lawsuit occurs, the court will look only to the terms of the agreement itself. As mentioned above, these are standardized agreements, and the terms that may have seemed like small print boilerplate at signing are very enforceable. It is important to consider these terms in their entirety in order to save trouble upon exit. Some businesses are certainly more suited for one or the other of these office spaces, but others can make use of either. For these businesses, it is important to carefully consider the needs of the business in order to find a space and contract that fits their entrance, presence, and exit needs.